Jon Athan: "150 Horror Writing Prompts" is now available for pre-order! 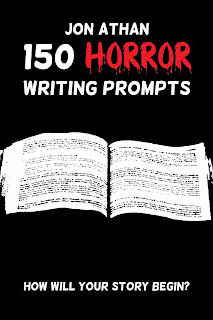 "150 Horror Writing Prompts" is now available for pre-order! Hello! First and foremost, thank you for supporting the launch of Enter The Vortex Vol. 3: Surreal Tales of Horror and Fantasy last week. If you're a fan of The Twilight Zone — one of the greatest shows ever created — I think you'll enjoy this third installment. It's available on Amazon for $2.99 or you can read it as part of your Kindle Unlimited subscription for free. That's not what this post is about, though. Today, I am proud to announce a new side project I have been working on. 150 Horror Writing Prompts features 150 unique ideas for aspiring and experienced horror writers. These writing prompts are detailed and creative — none of those one-line or definition prompts. The goal: inspire you to write. Through a meticulously-crafted set of prompts, I want to help you craft your own scary stories. I want to give you terrifying ideas to conjure nightmares of your own. This set includes ghosts, zombies, vampires, serial killers, psychological horror, and much more. Best of all, it costs $0.99 and you can read it as part of your Kindle Unlimited subscription! Anyway, thank you for your support. Whether you read my unconventional stories or look to find inspiration in my prompts, I hope you are entertained and satisfied. I can't thank you enough for your readership. If you're looking forward to the next book, stay tuned for details — they're coming very soon. Enter The Vortex Vol. 3 is available now!